SOLD; available for painted custom reproduction of the original to order. 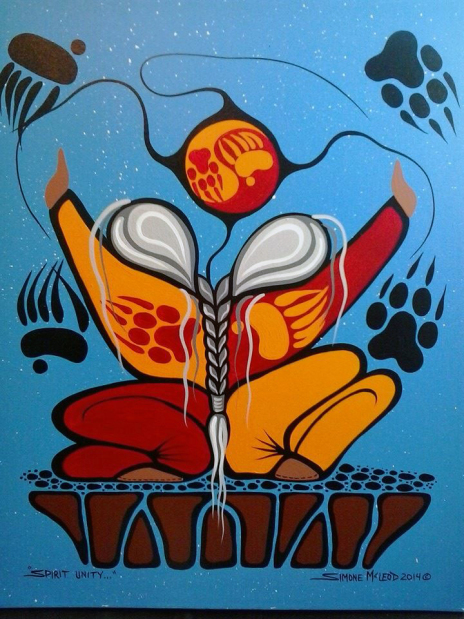 Contact Simone McLeod or Zhaawano Giizhik for inquiries about the price of a custom reproduction of the original. "Spirit Unity" - Bear Clan and Wolf Clan have always worked together for the protection of the People. The claws of Makwa (bear) and Ma’iingan (wolf), as well as those of Bizhiw (Lynx), and Waabizheshi (Marten), represent virtues like strength, courage, perseverance, and guardianship. They are warrior symbols of great magic that reflect the doodemag (clans) and the proud status and spiritual legacy of many an ogichidaa in Anishinaabe society, ininiwag (men) and ikwewag (women) alike, even in our day.